Historical Museum of Crete is 4khm away from the Nikos Kazantzakis airport, 1khm away from Heraklion's Port Station and 800m from Heraklion's Bus Station. 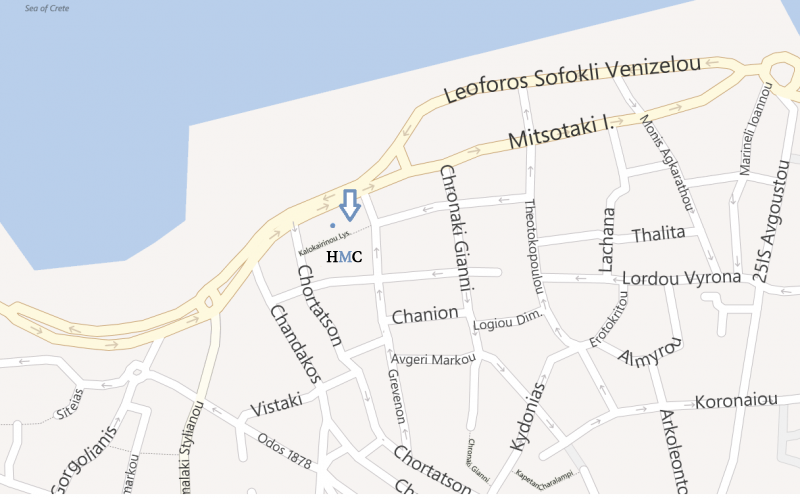 It is located at the coastal avenue of the city approximately 500m away, by feet, from Heraklion's center. Access for disabled persons is via a wheelchair ramp at the entrance of the Historical Museum of Crete, at 27, Sofokli Venizelou Str. Access to the floors is by elevator. Yamalaki 50, Τel. : (+30) 2810 282731, 200 m.
Gorgolaini 18-22, Τel. : (+30) 2810 314891, 300 m.
Arkoleontos 1 & Almyrou, Τel. : (+30) 2810 286733, 400 m.